Marvel's latest outing continued to reign supreme atop the Korea box office, but a string of new releases shuffled the rest of the pack considerably. 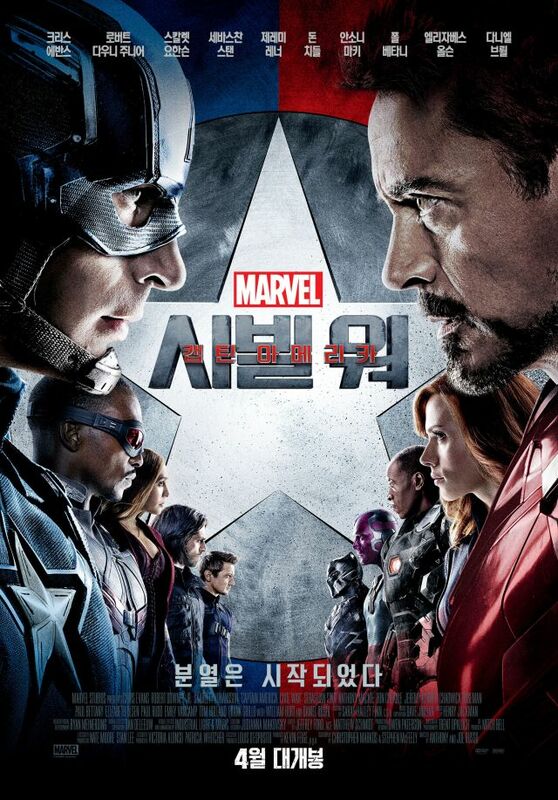 This latest superhero flick was released in Korea late last month and topped the charts its frist weekend out by capturing over 90% of the box office pie. Over the weekend, Marvel's mighty movie added another 1.5 million admissions (64.8%) to bring it total tally now to 7.3 million ($52.7 million). Worldwide, "Captain America: Civil War" has, to date, banked an incredible $678.4 million. Although "Civil War" continued its commanding performance into week two, there were a number of new releases that disrupted the upper echelons of Korea's top ten, starting with Jo Sung-hee's fourth flick: "Phantom Detective". Starring Lee Je-hoon, Kim Sung-kyun and Park Geun-hyung, "Phantom Detective" spins a Robin Hood-style tale that captured the attention of 508 thousand filmgoers (19.9%) during its first weekend out. The top two films, "Captain America: Civil War" and "Phantom Detective", managed to capture around 84% of the box office pie. Third and fourth place went to two new animations from Korea and China respectively: "Theatrical Cut - Hello Jadu" by director Son Seok-woo claimed 4.2% of the sales (117 thousand admissions) during its first weekend out, while the Chinese 3D animation, "The Magical Brush" by Frankie Chung, followed in fourth with just under 70 thousand stubs going its way (2.5%). The American animated blockbuster "Zootopia" was next with 65.5 thousand admissions (2.5%), a film that has been active in the Korean box office since mid-February, and with that sum, the film's total tally moves to a healthy 4.6 million, or $31.5 million. Globally, Disney's anthropomorphic adventure has grossed almost a billion dollars. Sometimes there are features on the Korean chart that come somewhat as a surprise, like this weekend's number five: "Walking with Dinosaurs: Prehistoric Planet" from the BBC. According to the BBC website, the film was inspired by the 2013 film "Walking with Dinosaurs: The Movie" and follows a herd of plant-eating dinosaurs "from the moment they hatch, they face predators, extremes of weather and natural disaster as they fight for survival". The film attracted 47 thousand admissions (1.7%) and was followed by another dino-themed affair in the form of Lee Dong-hee's animated documentary "DINO X Adventure Squad" (voiced by Jung Joon-ha and Haha). Lee's film was given 306 screens from which to pool from and claimed 35.2 thousand admissions (1.2%). kwak Jae-Yong's thriller, "Time Renegades" starring Im Soo-jung and Jo Jung-suk, took a serious tumble in the wake of all the new releases that entered the fray, falling from second to eighth place with 17.9 thousand admissions (0.7%). Since its release mid-April, "Time Renegades" has banked $8.2 million accumulated from 1.1 million admissions. John Crowley's drama "Brooklyn" climbed one place to nestle in ninth with 6.7 thousand (0.2%), and the weekend's top ten was rounded out by "Under the Sun", a documentary that looks at the lives of ordinary North Koreans in a surreal glance over the border. "Under the Sun" had just 58 screens from which to pool, but from them managed to score 6 thousand admissions.